The scale of the returns from a Japanese dealer has been staggering. The Italian reports suggests a stock of some 20,000 objects. And such a supply is clearly not intended to be static. 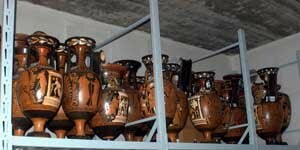 What was going to happen to the massed ranks of Apulian pots? And what has happened to previous arrays of recently surfaced antiquities? The name of the Japanese dealer has yet to be released formally (though it will be later today). However auction-houses and dealers will need to check to see if they have done business with this individual. And museums and private-collectors will need to check the collecting histories (or "provenance") of acquisitions to make sure that they have not got material from this source. Putting heads in the sand is not an option. The raid in the Geneva Freeport is reported to have yielded documentation. Will we be looking at further major returns? And if there are still people who believe that antiquities appear on the market as if by "magic" (sorry, from old European collections) then I would suggest that they will need to revise their views fairly rapidly.